Posted on Friday, February 13th, 2015 at 11:45 am. Animal welfare organizations will be onsite at 1,300 PetSmart stores on Saturday, February 14 and Sunday, February 15 with the goal of finding homes for adoptable pets looking for loving forever homes. 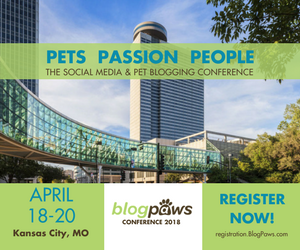 Members of the BlogPaws team will be at the events as well. Tom Collins and Yvonne DiVita will make an appearance, Sunday, at a PetSmart in Henrietta, NY during their New York state visit. Robbi Hess will also be at the PetSmart in Henrietta or in Greece, NY. Chloe DiVita will visit two PetSmart locations in Colorado. “Being able to be on site and hopefully witness a family finding the pet of its dreams will make this one of the best Valentine’s days ever,” BlogPaws Blog Manager, Robbi Hess said. If you’ve been thinking about adopting a pet, make it your Valentine’s gift to yourself and your family and visit a PetSmart location near you. RSVP on the PetSmart Charities Facebook Page. If you adopt a pet this weekend at one of these events, please share your pictures with us!